Dog dad Lester sure does love his pooch. 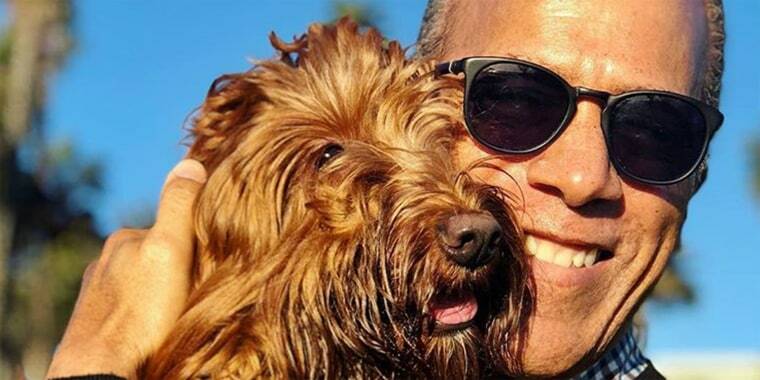 Lester Holt is a busy guy as a news journalist (and baker and bass guitarist), but he always makes time for his precious labradoodle, Lucy. The NBC Nightly News anchor showed off his adorable "morning routine" with the beloved pooch via Lucy's own Instagram account. The video post shows Lucy giving her best pal two high-fives and a fist bump before Lester heads off to work bright and early. The pup then trots after her departing dad as he heads out the door. These two make quite the duo! Lucy, who's now 2, was welcomed with open arms into Lester's family in 2016. He shared a sweet photo of Lucy as a puppy in the days that they got her — and boy, has she grown since then! Lester is of course a family man — just ask his incredibly cute grandson, Henry, who surprised his grandfather at his Rockefeller Center office back in July. Lester's son Stefan Holt, an anchor for WNBC in New York, and Stefan's wife, Morgan, welcomed Henry — Lester's first grandchild — in September 2017. "Not sure I’ll have the smile wiped off my face by air time! #ProudGrandude," Lester gushed on Instagram. Aww! Lester sure does have a whole lot of love in his life.